In a house in Bradford, north England a scene is being played out that is as old as Christianity itself: the faithful gathering in a home to share fellowship and the gospel. The guests, some of whom have travelled from many miles away, are kept well supplied with food and drinks by Mrs Kubra Hussain: cups of tea to quench thirst, spicy chicken and chickpea curries served with chapatti to assuage hunger. 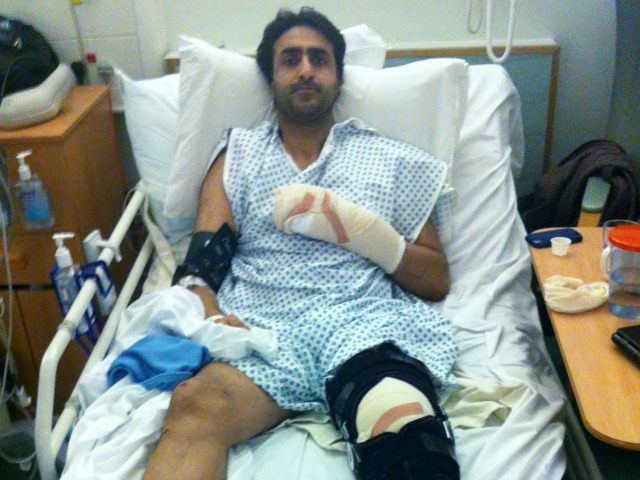 But Mrs Hussain and her husband Nissar are also victims of that other enduring feature of religious life: persecution. Nearly 2000 years ago, just a year after the crucifixion of Jesus, St Stephen was stoned to death for his faith. A few years later, St Paul was jailed and then beheaded for his. Today, in Syria, the Christian faith is fast disappearing entirely, centuries old communities wiped out by Islamic jihadists with barely a whisper of condemnation from the west. As shocking as the episode was, it was merely the culmination of fifteen years of persecution that the Hussains have endured since they left Islam and converted to Christianity. But he was forced to hide his burgeoning faith from his family. Islam teaches that the Bible is full of lies, and to read it is taboo. Nissar read his copy only in his bedroom at night, away from the gaze of his family. One night, however, he fell asleep reading it. His mother came into the room and found the book next to him. The reaction is telling as it highlights a cultural stumbling block for Muslims in the west: many Muslims conflate Christianity with Western culture, which they see as decadent. According to Nissar, equally divisive is their tendency to view Muslims as superior to westerners. “They view non-Muslims as second class citizens, as infidels. “They seem to have this superiority complex that they are God’s best. And therefore they denigrate – they view others as second class or of a lesser standard as they simply because they’re not in the Islamic faith. “On the whole, the religion differentiates them from non-believers, and therefore as God’s best they end up in their own communities. When Kubra herself turned to Christianity some months later, the other Muslim mothers on the school playground had a similar reaction: “[T]hey asked her, with disdain, why don’t you now wear a blouse or a miniskirt? Why don’t you take off your shalwar kameez? Nissar has had numerous cars vandalised and destroyed by young Muslims in the local community, and seven years ago the family was forced to move home after a local gang set fire to an empty house adjoining their home, in the hope that the fire would spread. Yet as shocking as those attacks were, the most chilling episode came not long after he and his family had converted to Christianity. “I was in a video shop with my eight year old and six year old at the time, and a young Pakistani man I knew fairly well was working there. He used to roll out the red carpet and be all wonderful: ‘brotherly this and brotherly that’. “He found out [that the family had converted] through the community grapevine. When I went up to pay for the film, he said to me “If you were in the Middle East or Pakistan, I would be the first to chop off your head”. But Nissar has not found solace within the Church of England, who he says have abandoned him and other persecuted converts like him. In 2005, when he first spoke out to the media, Nissar was invited to meet the then Bishop of Bradford, David James. Nissar and his family do not currently attend a church, as he has found it hard to find fellowship and friendship, especially when the attacks started up again. He says people are just too frightened to be seen helping the family. But the majority of his ire is directed at the church hierarchy, who he believes should be making a stand for persecuted Christians, wherever they are in the world. “I’m not the only convert, there are many in fear. But the church has never spoken out. “Why can they not just stand up and say: look, this is unacceptable. It is a free country which welcomes everybody and affords all the religious freedom in the world. We afford you your places of worship, mosques galore and all the rest of it, we now need for you to denounce these certain rogue elements within the community who are attacking Pakistani converts to Christianity. “Our brothers and sister in Pakistan are paying with their lives! The office of the current Bishop of Bradford, Toby Howarth was contacted by Breitbart London for a response to Nissar’s allegations of abandonment, but no reply has been forthcoming. However, on the weekend he released a joint statement together with Mohammed Rafiq Sehgal, President of the Council for Mosques rejecting “hatred or violence” towards converts. Since the physical attack, which happened outside his front door, Nissar said the house has been like a prison. “My children never go outside, they never play in the street. I fear not only for my own children’s future, I fear for this country and what it’s becoming. “The police have created this two tier law system and the churches seem to condone Sharia law. The family are now planning to leave Bradford entirely and move to a majority white area, turning their backs on the British Pakistani community entirely. “I’ve tried to stick up for the Muslim community, but they’ve looked on. Most have turned a blind eye, and some even condone it. Yet they themselves enjoy this wonderful liberty, religious freedom. They enjoy all the fruits of the west and every opportunity the west affords them.